Field to Cup is having a Black Friday Sale! This site is confusing me. It looks like shipping is free for orders over $15. (per month?) which wouldn’t cover the charge for the basic membership. It says that it won’t automatically renew, except that it says it does for the basic membership. It won’t take Paypal for the basic, either. I clicked on Place Order, and nothing seemed to happen. It didn’t highlight any field(s) that might have been a problem. I’m at an impasse! Maybe it just isn’t meant. I had this sub for several months but quit because their website is awful. It is very slow and constantly kicked me off when I went on it. Great tea but not worth the frustration! Thanks for your comment! Yes, our website was awful earlier this year because of site loading issues. Please let me know if you still have concerns! I’m sorry for the confusion! 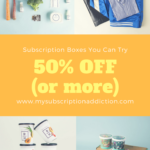 Subscription Boxes are always FREE shipping in the US. The free shipping over $15 is for our other products, and is indeed only valid for a short time. Prepaid subscriptions will not automatically renew, you only pay upfront for the prepaid term. Paypal should be available for you under the Credit Card option on the checkout page. Our Prepaid codes have been updated for CYBER MONDAY, you can use the links above in the review to reach those deals! I’m happy to help out with an ordering issues and even create a subscription for you, just email me directly at [email protected]. The website shows free shipping this week as well for orders and they have a rewards program. I used this deal to upgrade my monthly sub from another tea service. Thanks so much for subscribing with us! We have a wonderful rewards program, as you mentioned. Be sure to take advantage of our pre- and post-shipment Tea Replacements! You can request one anytime at [email protected].